You can't grill up this Cheerwine Cake, but it would be an easy and tasty end to a great barbecue meal. Acutally, you can wrap slices in tin foil (as well as doughnuts and other tasty treats) and heat on the grill for a warm dessert at an outdoor party. 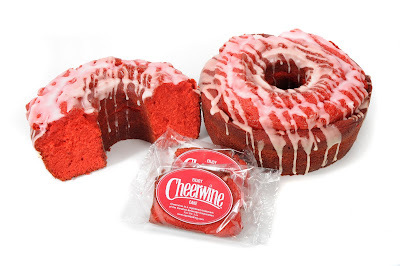 The Apple Baking Company just came out with these Cheerwine Cakes. I found out when of the students I taught, Hilah, stopped by the college. We were talking about this and that, and she mentioned the new cakes. She works at Miller Davis Inc. in marketing and helps with new product campaign launches. I'm thrilled that she is using skills I taught her in class and also that she took the time to drop by and say hello. The Apple Baking Company is a small company right down the road. They are famous for making Apple Uglies (as well as other sweet treats). Apple Uglies are kind of like Monkey Bread or braided bread with apples. You might call them a type of apple fritter. Whatever you liken them to, Appple Uglies are really tasty. And, they aren't even really that ugly either. Cheerwine is our local soft drink - made out of Salisbury, NC. Some people say it's like a cherry cola, but that doesn't really capture this unique soda. It's just different - and very popular in the South. Some of our Southern cooks make Cheerwine Cake, and I need to get that up at Yes You Can Cook. Cheerwine Cake looks a bit like Red Velvet Cake, but the flavor is different. Apple Baking Company and Cheerwine teamed up to get this unique cake out there on the market. Great idea. It really is a super cake - and not like any I've ever had before. You can order Apple Uglies and other products online through the company web site, but I don't see the Cheerwine Cakes up yet. I think they're selling too fast right now and just on the market as well. Keep an eye out. I see Apple Baking Good products from time to time and especially at country type stores. The Uglies are really tasty and so is Cheerwine Cake. * The photo was provided by Miller Davis - THANKS!